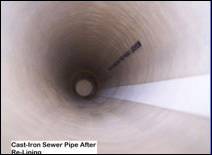 Sometimes only a small section of a pipe needs to be lined, which costs a lot less than lining the entire length. 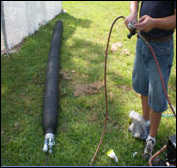 But the best thing about this “Point Repair” or “Sectional Repair” is that the bladder that holds the hardening pipe liner against the wall has a hollow tube throughout its length, allowing flow in the pipe to continue DURING the repair. 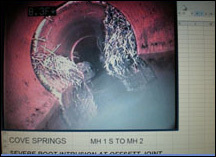 So there is no need for bypass pumping from manhole to manhole or to tell residents to stop using their facilities.